Collaborating scientists in the U.K., Spain and Italy have uncovered how the toxic clusters of protein molecules that cause Parkinson’s diseases latch onto the membranes of brain cells and disrupt integrity the lipid bilayer, causing cellular dysfunction that leads to cell death. Using techniques including solid state nuclear magnetic resonance spectroscopy (ssNMR), the researchers, led by professor Christopher Dobson, at the University of Cambridge, and Dr. Alfonso De Simone, from Imperial College London, identified two a components in the α-synuclein oligomers that allow the toxic tangles to latch on to and disrupt lipid bilayer integrity. They also confirmed that generating mutations that target regions of the oligomers involved in membrane interactions inhibited toxicity in cultured brian cells. Parkinson’s disease and other neurodegenerative disorders are characterized by the aggregation of α-synuclein into amyloid fibrils within Lewy bodies, the resaesrchers write. However, studying how the toxic oligomer clusters penetrate and damage cells has been difficult because they are inherently unstable. The U.K. team, working with colleagues at the University of Southampton, the University of Florence, Italy, and the University of Zaragoza in Spain, generated stabilized toxic and non-toxic forms of α-synuclein, which were similar in size and morphology, but demonstrated very different abilities to disrupt lipid bilayers. The toxic form, but not the non-toxic form, significantly disrupted human neuroblastoma cells and rat cortical neurons in vitro, and caused cellular damage that was similar to that observed in models of Parkinson’s disease. The researchers then used solid-stage nuclear magnetic resonsnace spectroscopy (ssNMR) and other techniques to probe the structural properties of both the toxic and non-toxid forms of the α-synuclein oligomer. They identified in the toxic form an exposed, highly lipophilic region of the oligomeric protein that promotes strong interactions with the membrane surface. 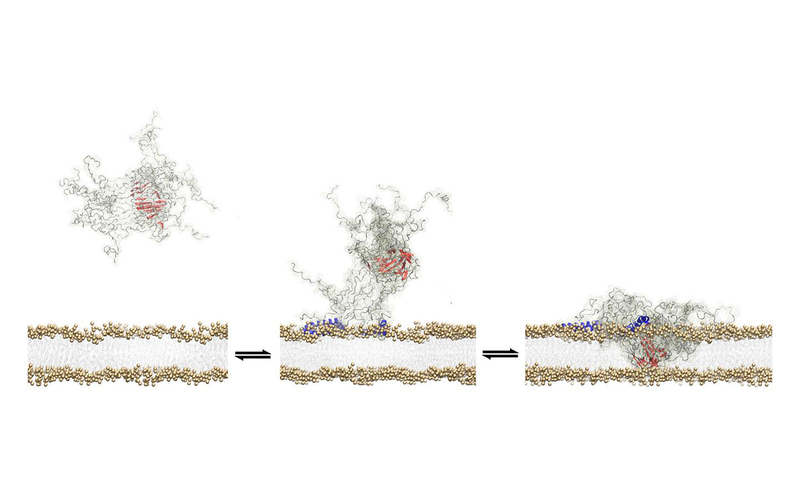 A second region identified as a rigid oligomeric core, can then insert into the lipid bilayer and disrupt membrane integrity. When tested against primary neurons and astrocytes, the toxic proteins caused an increase in basal levels of intracellular calcium ions and reactive oxygen species, leading to cell death. Toxicity to both neuroblastoma cells and primary cortical neurons was significanty reduced when the team generated mutations that target the region involved in promoting membrane interaction by α-synuclein oligomers. “One of the really exciting things about this work is that not only has it been possible to define the structure of the critical pathogenic species in a neurodegenerative disorder, but we have also managed to propose a mechanism for its toxicity, providing vital clues for pursuing rational therapeutic strategies,” added Professor Dobson, who is Master of St. Jon’s College, Cambridge, and a director of the Centre for Misfolding Disease, which was alucnhed by the University of Cambridge just a couple of months ago, based in the Department of Chemistry. The new centre aims to develop therapeutic strategies for disorders including Parkinson’s disease, building on work that helps to uncover the basic processes that underlie neurodegeneration.